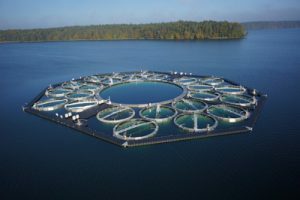 Connectivity and Synchronisation of Lake Ecosystems: Following a phytoplankton bloom by manipulating connectivity and retention time in a large-scale enclosure experiment. Project lead: Stella Berger and Sabine Wollrab. Planned in August 2019. (Description of the planned experiment and scientific background, see below). Timing of the LakeLab experiment: The large-scale mesocosm experiment is planned ca. seven weeks in August 2019 with 2 weeks of flexibility before and after. This will include experiment preparation, conduction and after-work, where all participants are expected to participate as an integral part of the application period. We encourage a wide range of Transnational Access (TA) users to apply: You may come from public authorities, technological partners, and research or teaching institutions. As we plan to observe whole-ecosystem responses, everyone with expertise or interest in plankton communities or pelagic processes is welcome to apply. We specifically invite researchers and trainees to work with automated phytoplankton analyses (using e.g. FlowCams, Accuri), experts on blue-greens and theirs toxins, greenhouse gas emissions, near remote sensing experts, lake physicists interested in the hydrology of the enclosures, and trainees for preparations. We will also deploy video-based in situ zooplankton recorders, for this task persons with interest in zooplankton and/or programming are welcome to apply. A total of at ca. 250 person days will be allocated to external users through Transnational Access provided under AQUACOSM for 2019. It is anticipated that AQUACOSM will support stays of at least 5 persons for ca. 50 days, or potentially other combinations. If you are interested, please contact us (berger@igb-berlin.de and wollrab@igb-berlin.de) well before the application deadline, so we can advice you about possible options. Introduction to the project: Lake ecosystems face severe anthropogenic forcing through land use alteration and climate change, which compromise water quality and provision of ecosystem services. Effective management decisions for preservation of ecosystem functioning rely on mechanistic understanding of a lake ecosystem ́s response to environmental stressors. This response is influenced by features of the lake itself as well as by its surrounding landscape. Currently, the importance of a lake ́s regional context is largely ignored, although lakes are closely connected (i) to their surrounding landscape via their catchment, and (ii) to neighbouring lakes via rivers. To improve our mechanistic understanding of biological coherence in river-connected lake ecosystems, we will test the following hypothesis: Lake-to-lake connectivity (LLC) drives biological coherence in lake chains at sub-seasonal timescales and facilitates widespread impact of eutrophication events. By homogenising water chemistry and phytoplankton communities, LLC fosters seasonal coherence (i.e. synchronous behaviour) with regard to water constituents, primary production and hence ecosystem functions. Here, LLC is expressed as the inverse of (average) water residence time (i.e. turnover rate) of one or more downstream located lakes, and coherence is measured as average correlation between all neighbouring pairs of lakes in a chain with regard to a biological property. Through nutrient loading from the catchment, local weather events may disrupt coherence by driving localised eutrophication dynamics, but this effect is modulated by connectivity. Higher LLC allows faster and spatially more extensive impact propagation through a lake chain. Due to non-linearity in pressure-impact relationships this may then facilitate increased eutrophication impacts at the regional scale of the lake chain, i.e. a higher risk of cyanobacterial blooms and an increase of CH4 relative to CO2 emissions. More information on the overall project CONNECT: www.igb-berlin.de/en/projekt/connect. 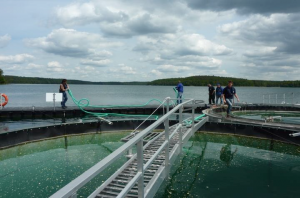 Description of the LakeLab experiment: In order to test the little investigated case to what extent LLC drives biological coherence and eutrophication impacts in deep lake chains – we will run a controlled experiment in the IGB-LakeLab large-scale mesocosm facility. We will set up six experimental circular lake-chains of four mesocosms each to create a connectivity gradient based on (epilimnetic) water residence times typical for lakes in the area. 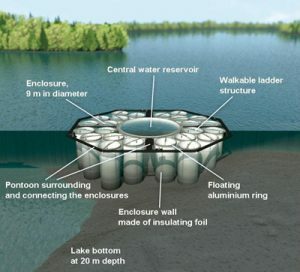 To ensure identical initial conditions, all mesocosms will be simultaneously filled with water from the surrounding Lake Stechlin right before the start of the experiment. At the experiment start, a nutrient-runoff event will be simulated by adding approx. 10 times the background value of P and N (Redfield ratio) in the epilimnion of one mesocosm of each circular chain (red in Fig. 2B). Then the flow among mesocosm ‘lakes’ will be started by pumping water (including phytoplankton and nutrients) from each mesocosm into the following. Within the experimental duration (ca. 30 days) we expect a notable part of the water body to achieve complete recirculation only in the lake chain with the lowest residence time. Measurements: During the experiment we will monitor temporal coherence of phytoplankton dynamics, cyanobacteria bloom formations and GHG production. Each mesocosm is equipped with a high-frequency (hourly) in situ multi-sensor profiler that measures light (PAR), temperature, pH, conductivity, oxygen, redox potential, turbidity, total Chl a and other algal pigments (bbe-fluoroprobe). High-resolution in situ water column analyses will be combined with 24 newly developed near-RS mini-spectrometers monitoring algal dynamics at the surface in high temporal resolution. Additional hyperspectral RS tools, e.g. as airborne cameras (i.e. Hyspex) and field spectrometers, will be used for reference measurements. Gas sensors and flux chambers will monitor concentrations and fluxes of CO2 and CH4. Sedimentation to the deeper layer will be studied with sedimentation traps. Effects of light pollution (and brownification) on lake ecosystem structure and function in response to altered zooplankton diel vertical migration: a large-scale enclosure experiment. Project lead: Mark Gessner, Franz Hölker, 01/08-31/10/2018. Timing of the experiment: The large-scale mesocosm experiment will be about three months starting at the beginning of August and run until the end of October. There will be a hot phase of 4-6 weeks for intensive experiment preparation before the actual start of the experiment (in addition to more long-term preparation). Users for TA: We plan to observe whole-systems responses; everyone with expertise in plankton communities or pelagic processes is welcome. We specifically invite experts in fish-labelling, sensor deployments on fish, researchers and trainees to work with the FlowCam, experts on mixotrophs, blue-greens and theirs toxins, cell stress (e.g. oxidative stress), near remote sensing experts, physicists interested in artificial light sources, trainees for preparations. A total of at least 240 person days will be allocated to external users through Transnational Access provided under AQUACOSM for 2018. It is anticipated that AQUACOSM will support stays of at least 4 persons for 60 days or other constellations. Introduction to the project: Light is key in structuring ecosystems and biological communities. During the last decades globally averaged artificial light emissions increased by 3 to 6 percent per year, occasionally even up to 20 percent. The “loss of the night” affects all industrialised regions in the world and is thus an additional element of global environmental change caused by humans. Also lakes can be disturbed by light pollution – the riparian areas through direct lighting, the open water by a diffusely illuminated night sky. This phenomenon of skyglow is mostly driven by clouds back-scattering artificial lighting above, for example, towns and greenhouses. Although the intensity of skyglow compared to direct light is low, it can extend over very large areas and therefore also affect lakes and aquatic organisms. The influence of the loss of the night for lake ecosystems, their functioning and biodiversity are largely unknown. Potential effects of skyglow may be modulated by another element of global environmental change: the increase of coloured dissolved organic matter in freshwaters. Such “brownification” leads to changes in water column light climate and general darkening during day and night, besides potential effects via increased organic energy availability. Description of the experiment: We want to study the ecological consequences of skyglow (i.e. diffuse artificial lighting at night) and the underlying mechanisms. The experiment will be performed in the LakeLab, where skyglow is simulated in 6 enclosures using a specially developed light system. We expect that the new lighting conditions will influence the physiology and behaviour of key species. Our special focus is on Daphnia and other zooplankton. They usually show a diel vertical migration pattern: While during the day they hide in the darkness of the deep water to avoid predation by planktivorous fish, they migrate up to the surface water in order to feed on algae at night. However, an altered migratory behaviour would also change the interactions between organisms in the food web and thus the material flows in the lake. The two-level skyglow treatment (control vs. skyglow) will be crossed with the addition of highly coloured humic substances to study interactions of skyglow with a changed underwater light environment. The resulting experimental design is 2-factorial with two levels per factor and a sampling size of 6 enclosures for each factorial combination. Even though the humic treatment will be rather low, this design also offers the possibility to study the light effects of brownification in isolation. Our results promise both fundamental new insights into the effects of nocturnal lighting on lakes modulated by brownification and will provide important information for future water management. 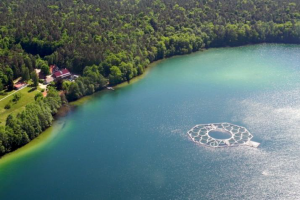 The IGB LakeLab in north-eastern Germany is located in Lake Stechlin, a deep clear-water lake representing the extensive southern Baltic lake district. 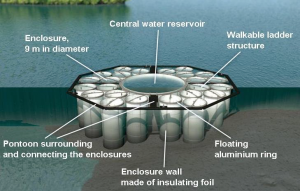 The facility consists of 24 cylindrical mesocosms (Fig. 6.1.1) enclosing water volumes of 1270 m3 (9 m diameter, 20 m depth). A large central mesocosm (30 m diameter, 14,000 m3 volume) serves as water reservoir and can also be used for experimentation (e.g. deployment of mobile mesocosms as described in WP9). Flexible curtains attached to sturdy aluminium floats extending into the sediment enable experiments on benthic-pelagic coupling – a unique feature of mesocosms in deep waters. Continuous operation during winter is possible under ice. Water is renewed by high-throughput impeller pumps (100 m3/h) that minimize disturbance of plankton. The same pumps have proved excellent to manipulate mixing regimes and stratification patterns. Furthermore, perforated stainless steel rings can be connected to a compressor to aerate the mesocosms at any given depth. Other gases (e.g. N2, CO2, CH4) and solutes could be injected as well, whereas application of xenobiotics or introduction of foreign species is precluded. Thus, the physical structure and chemical composition of the water can be conveniently manipulated in multiple ways, despite the large size and large number of replicate experimental units. This combination of large number and size of mesocosms is unmatched worldwide, enabling multiple experimental designs involving more than a single factor and yet ensuring adequate replication. This opens entirely new research perspectives, ranging from hydrological, chemical and biological replicated experiments to testing of large instruments and calibration opportunities for remote sensing. 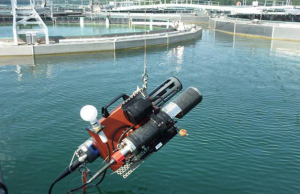 The unique value of the IGB LakeLab is further enhanced by vertical profilers recording water-quality parameters in real time (30 min intervals) along high-resolution depth profiles (0.5 m steps) are another outstanding feature of the LakeLab (Fig. 6.1.2). All 24 mesocosms are equipped with automated sensors to record photosynthetically active radiation (PAR), pressure (for accurate depth positioning), temperature, pH, conductivity, O2 concentration and fluorescence-derived biomass estimates of cyanobacteria, diatoms, green algae, cryptophytes and total phytoplankton (bbe fluoroprobes). Four identical additional profilers are deployed in the open lake. The profilers are controlled by industrial computers that also collect and transmit data to a central data base server for routine quality checks and storage. Risk of data loss is minimized by multiple security levels. Fig. 6.1.2. Bridge over an enclosure for easy access (left), and profiler carrying sensors (right). Photos: IGB. Key to the operation of the LakeLab is its proximity to well-equipped laboratories of IGB Stechlin, which are located directly on the lake shore (Fig. 6.1.1 left). Boats of various sizes ensure quick access (<5 min) to the laboratories, facilitating prompt analyses of delicate live samples. Laboratories include a radioisotope lab (14C, 3H, 33P, 35S), molecular S1 labs and 3 walk-in climate rooms in addition to standard labs. Analytical instruments include 3 autoanalysers for nutrients (FIAstar), an ion chromatograph, UV-Vis spectrophotometers, 2 fluorimeters, a TOC/TON analyser, a carbon analyser, a CaCO3 analyser, 2 GCs, 3 HPLCs, an ultracentrifuge, 2 flow cytometres, a Color FlowCAM, 2 scanning electron microscopes (SEM), bright-field and epifluorescence microscopes, some of them equipped with image analysis systems, as well as other standard laboratory equipment (autoclave, high-capacity freeze dryer, ovens, clean benches, centrifuges, etc.) and field gear (mutiprobes, plankton nets, sedimentation traps, sediment corers, etc.). Empty lab space can be provided to set up equipment and instrumentation according to specific user needs. A long-term monitoring programme on Lake Stechlin provides background data on water chemistry, phyto- and zooplankton, fish as well as primary and bacterial secondary production. Meteorological and other environmental data are recorded by the German Environment Agency on site. A total of at least 720 person days will be allocated to external users through Transnational Access provided under AQUACOSM for 3 years. It is anticipated that AQUACOSM will support stays of at least 4 persons for 60 days in years 2-4. The very large units of the facility means that experiments tend to run longer than in other mesocosm facilities. Consequently, a duration >30 days is typically expected to complete independent projects. Since logistic preparation of experiments at the LakeLab takes at least 6 months, TAs are anticipate to focus initially on integrating external users in activities already in the planning stage, specifically in experiments on brownification and light pollution planned in 2017 and 2018 as part of 2 funded projects. However, in addition to encouraging proposals for large experiments as soon as logistically possible, individuals and smaller groups are invited to apply for AQUACOSM TA support to cooperate at any time within more comprehensive projects, both planned and unplanned at present, resulting in joint publications of results and management recommendations. To maximise synergies, AQUACOSM activities will also be coordinated with long-term monitoring and other projects conducted in the LakeLab and Lake Stechlin. Services currently offered by the infrastructure: Users will have access to the laboratories and instrumentation at the LakeLab and IGB laboratories. However, to maximize benefit of on-site support and output, scientific cooperation with scientists at IGB Stechlin is strongly encouraged and will be supported by permanent technical IGB staff. Users are also encouraged to engage in scientific activities beyond AQUACOSM (participation in seminar series, journal club, group meetings). Experience from mesocosm experiments at other locations has shown that extended collaborative experiments offer excellent opportunities for networking and creative exchange that produces innovative ideas on scientific questions and industrial and environmental applications. Therefore, users are invited to get involved in social activities organized by both local staff and visitors. The relatively small size and remoteness of IGB Stechlin ensures ample opportunities for such informal exchange. This will be further facilitated by the offered accommodation at IGB’s fully equipped (kitchen, laundry facilities, garden) guesthouse (23 beds) in the nearby village at 20 min walking distance. Support offered under AQUACOSM: Users will have access to the laboratories and instrumentation at the LakeLab and IGB laboratories. However, to maximize benefit of on-site support and output, scientific cooperation with scientists at IGB Stechlin is strongly encouraged and will be supported by permanent technical IGB staff. Users are also encouraged to engage in scientific activities beyond AQUACOSM (participation in seminar series, journal club, group meetings). Experience from mesocosm experiments at other locations has shown that extended collaborative experiments offer excellent opportunities for networking and creative exchange that produces innovative ideas on scientific questions and industrial and environmental applications. Therefore, users are invited to get involved in social activities organized by both local staff and visitors. The relatively small size and remoteness of IGB Stechlin ensures ample opportunities for such informal exchange. This will be further facilitated by the offered accommodation at IGB’s fully equipped (kitchen, laundry facilities, garden) guesthouse (23 beds) in the nearby village at 20 min walking distance.